twi-star | Nail Art Blog: Instagram GIVEAWAY! Featuring Gridlock Lacquer and Julep! Instagram GIVEAWAY! Featuring Gridlock Lacquer and Julep! I'm having my very first giveaway over on instagram! Go follow me @twi_star and @gridlocklacquer to get in on the action! Below is the photo to re-post. 2. 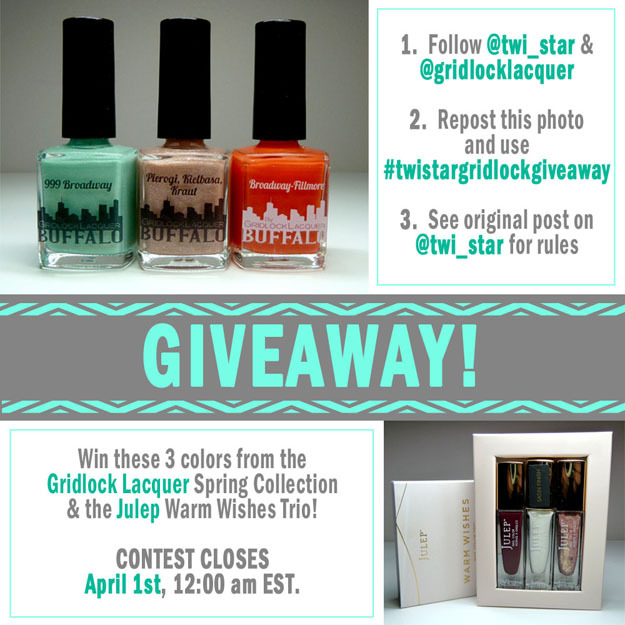 Must repost the above photo with #twistargridlockgiveaway and tag @twi_star and @gridlocklacquer in the caption. 8. Winner will be selected at random and notified via Instagram. Winner must provide valid email and shipping address within 24 hrs or a new winner will be selected. 9. No drama! Please be nice and all rules are mandatory and if not followed you will be disqualified. I reserve the right to disqualify someone for causing drama or bullying. 10. Giveaway closes April 1st, 12:00 am EST. I will do my best to announce the winner 24 hrs after the giveaway closes.